LNG does not burn or explode as a liquid. It can only burn if vapourized into natural gas, mixed with a certain amount of air and then provided with a source of ignition. Natural gas is lighter than air and will disperse into the atmosphere. 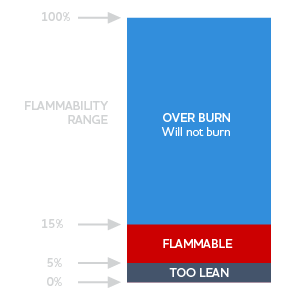 LPG (Propane) vapours are heavier than air and tend to collect in low-lying locations where a combustible mixture is easily formed. This makes LNG safer than LPG. Copyright © 2019 Nishal Enterprises Pvt. Ltd.